Eddy Sparks Residence - Lawrence Thompson Architects, INC.
"A spirited Painted Fire rebuild"
The Entry and South Elevation from the Circular Drive. The Entry and Living Room with Open Beam Ceiling & Fireplace. This simple one story Mediterranean home on Via Los Santos and San Antonio Creek Road, Santa Barbara, was designed for passive solar and through ventilation of the Living-Dining area. The owner later preferred a grove of tipuana trees on the south side of the building. 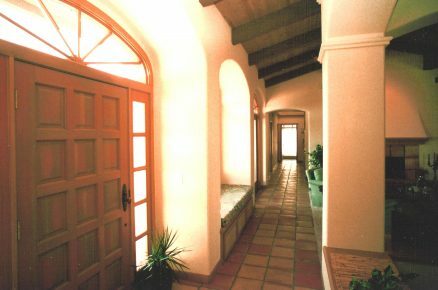 The heart of the house has vaulted ceilings, with archways to skylit corridors. Shown as a lower cost example which still includes many good features. Marc Hemming, Contractor.